Family Room Remodeling in Fridley MN | Bannochie Builders Inc.
As your family gets bigger and matures, the purpose of your family room may change. You may want to have different interests or activities. You might want to change your old family room full of video games and a TV to a craft room, music, or table games. Remodeling your family room is a great way for you to customize it to suit the preferences of your family. Designing a comfortable and useful recreation space at home can help your family enjoy the time you spend together. Changing your family room can provide a comforting environment for numerous activities that your family and friends can enjoy, and can improve the overall quality and value of your home. Updating your family room typically involves renovating the paint, flooring, lighting, and cabinetry, or maybe you want to knock down some walls to make more room. Remodeling your family room is a great time to upgrade new electronics, add a dining area, change the look of a fireplace, or change out those old windows, doors, and trim. No matter how big or small of a project your family room renovation may be, Bannochie Builders is here to help provide the knowledge and expertise to bring your family room into the 21st century. We are more than happy to work with your needs and budget to create the best family room you could possibly imagine. 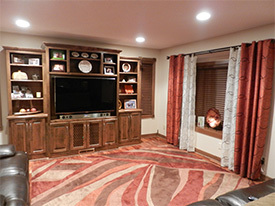 Call our office today if you are thinking about remodeling your family room!